Originally referring to the small vest pocket of a gentleman’s outfit in which a watch would be kept, the word ‘fob’ became associated with the watch chain when it became customary to wear watches on a chain. Its meaning evolved from ‘small pocket’ to the chain that held the watch. It also refers to the small decorative ornaments that are suspended from the watch chain, such as seals ( fob seals). 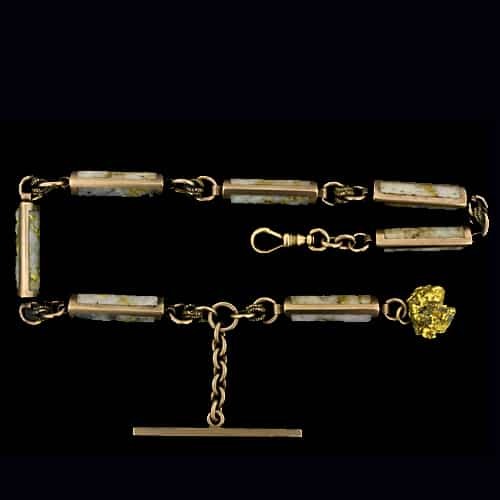 Fob Chain Composed of Seven Three-Sided Gold in Quartz Inlayed Links Set in Rose Gold with the Original Matching T-Bar and a Gold Nugget for Good Luck.